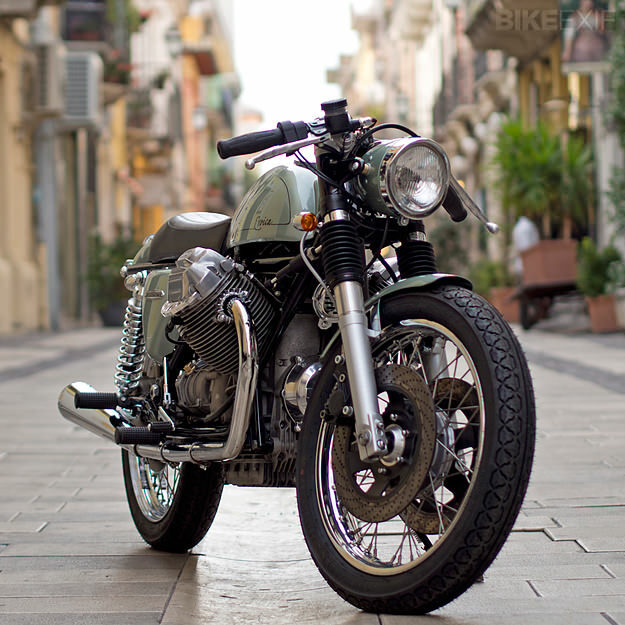 Most of the leading custom builders work on commission—they get a brief from a client, a direction is agreed upon, and a motorcycle starts to take shape. Compromise is inevitable, whether it’s around budget or aesthetic direction. But every now and then, as you can imagine, it’s good to get free rein. 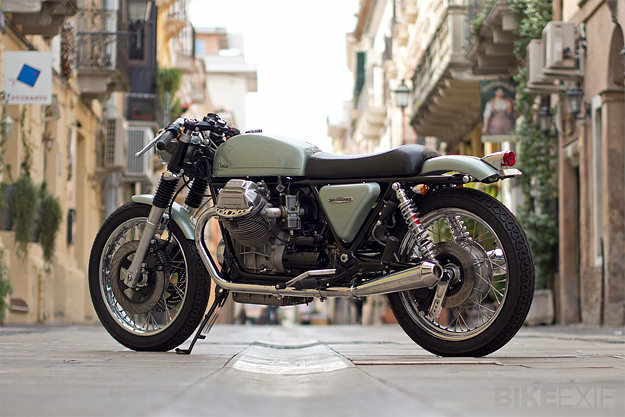 And that’s how Filippo Barbacane of Officine Rossopuro created this machine—a Moto Guzzi 1000 SP that he effectively built for himself. 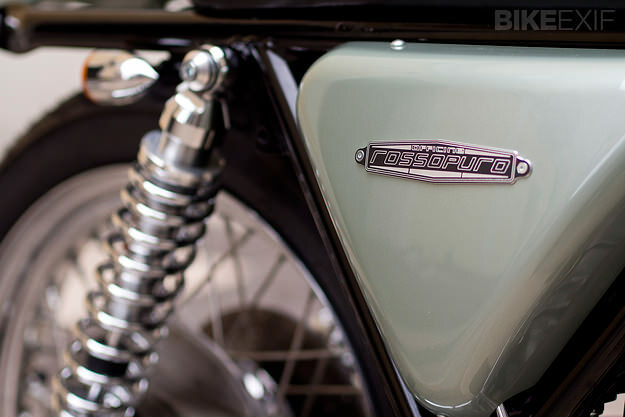 “I wanted to make a very classic motorcycle,” he reports. “One that looks simple and clean. 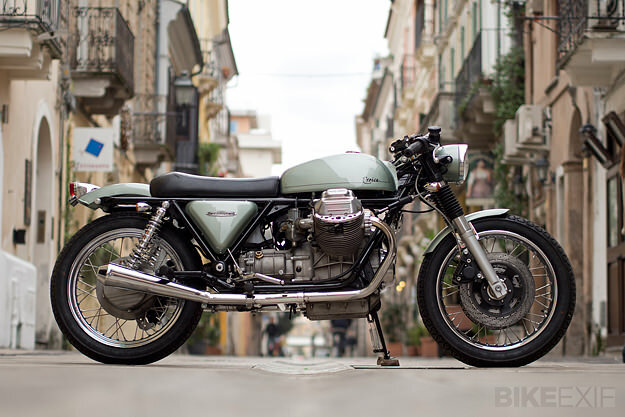 A bike that’s both slender and ‘long’.” Filippo wanted the color to look elegant too, so he selected a green hue from Moto Guzzi’s racing heritage. The 1000 SP arrived in exceptional condition, with only 24,000 km on the clock—an unusually low mileage for a 1982 bike. And with a broad, torquey powerband, little work was required on the engine. The highlight is the hand-crafted aluminum bodywork, a huge improvement on the somewhat chunky, squared-off standard paneling. The wheels are now spoked, rather than alloy, and adjustable Bitubo shocks are fitted to the rear. The front brakes have been upgraded to twin 300 mm Brembo discs, retaining the excellent standard linked braking system. 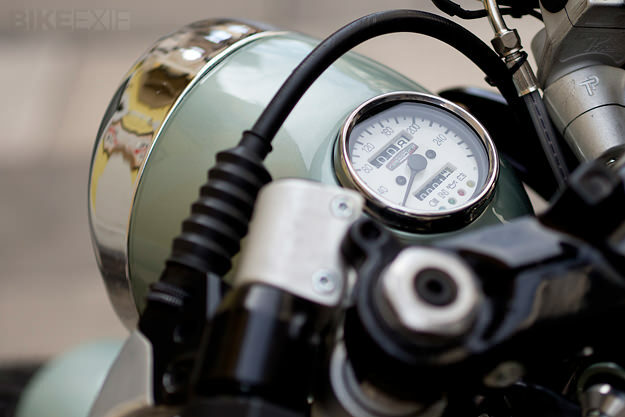 The bulky 1000 SP instrument panel has gone, and Filippo has flush-fitted a simple, single analog instrument into the custom headlight. The bowl is painted green to match the new bodywork, and is topped off with a hooded chrome bezel. And why the name ‘Eroica,’ meaning ‘heroic’? “It’s to remember the past,” says Filippo. “When bikes were ridden by heroes, lying down and stretched out, the chin a few inches from the tank.” An apt name for a long, low machine like this one. ‘Eroica’ is now for sale; interested parties should make contact via the Officine Rossopuro website.